Now, more than 30 years on, we can take a long look back at the blizzard of the 20th century. It was one of the worst blizzards in North American history. On January 28, 1977, a hurricane-like force with a frigid twist buried people in their cars and homes, killing thirty and injuring hundreds of others. Thousands of school children were trapped in rural classrooms before crews on snowmobiles could rescue them. Zoo animals took advantage of mountain-like drifts and trudged to freedom, oblivious to the arctic whiteouts and 60 degree-below-zero wind chill. Local roads became snow-clogged highways to hell. One law enforcer recalled filling out an accident report involving 50 cars and 113 people. Looters took to the streets, prompting one gun shop operator to post a sign that read: "Trespassers will be shot, survivors will be prosecuted." Rescuers on snowmobiles told tales of people begging for food and even birth control pills. Best-selling author Erno Rossi recalls gazing out his window. "It was like looking into a milk bottle," he said, knowing even then that there was a book in the making. 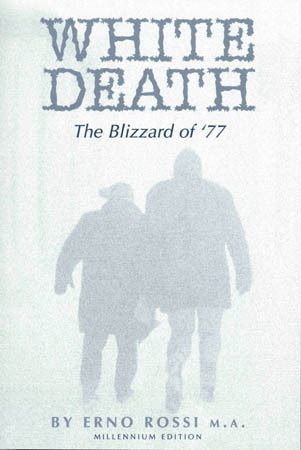 More than thirty years later, Rossi's riveting book White Death: Blizzard of '77 has sold more than 15,000 copies, making it one of the ten most successful books about Buffalo over the past quarter century. Now, re-released in a special 30th anniversary edition, this softcover book includes 50 photographs that chronicle one of the region's most dramatic historical events. 1. It snowed in Miami. 2. One hundred thousand cattle and calves froze to death in Kentucky with costs over one hundred million dollars. 3. That cold spell cost the Florida economy 2 billion dollars. 4. Some people in rural areas were isolated for up to 14 days. 5. Twenty- four hour a day emergency radio broadcasts saved a lot of lives. 6. More than 100 people died from the effects of the only blizzard in history declared a major disaster. 7. A good Samaritan approached a woman kneeling beside the road during the blizzard. That woman fell over. She had frozen to death. 8. Twenty -nine died in Western New York with wind chills of 60 below zero. Two died in neighboring Canada that had snowdrifts to 35 feet. 9. But Western New Yorkers and neighboring Canadians discovered a great way to stay warm during The Blizzard of '77. Their secret was revealed by the 18% percent jump in the birth rate and 45% jump in the abortion rate after the storm of the century. That's why local comedians suggest the three B's for surviving a blizzard: Beer- Bread- Birth Control.